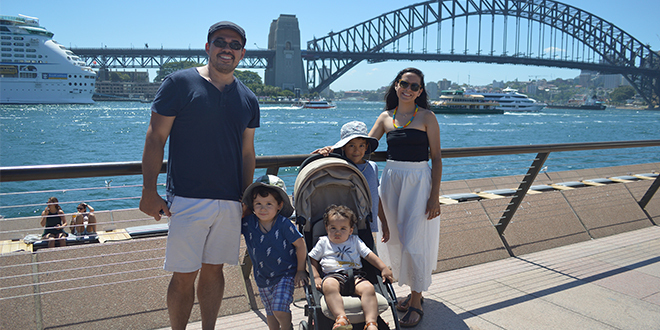 New life: Ana Hatherley with her husband Tony and children Alexander, Franco and Carlo in Sydney. EL Salvadorian-born Ana Hatherley remembers the excitement of boarding an airplane for the first time, bound for Australia. It was 1988, she was six years old, the eldest of three children. Young Ana and her family were fleeing their civil-war-torn country. Somehow it seemed like a great adventure. And it turned out to be the start of a faith-inspired life journey. “My parents have always had an incredible ability to turn every experience, no matter how bad, into promising and hopeful opportunities for me and my siblings,” Ana said. Her mother was an economist, her father, an electrical engineer, who had survived a murder attempt. “The fact he survived it placed our family in great danger,” she said. “We desperately needed to leave the country and thanks to a new humanitarian program that had been introduced in Australia that year, our family was accepted as refugees. “We settled in Brisbane where we all fell in love with Australia. Like most children in El Salvador, Ana was raised a Catholic and attended a Catholic school. “Faith in God has always been a central part of our family life,” she said. “My parents didn’t just tell me God was real, they showed me how real he was by recognising all the ways in which He manifests himself in our lives. “They saw God in all the good that happened and in the ways He carried us through troubles during the hard times. “My parents’ love for God was enormous and it touched everyone around them. “I have felt that love for as long as I can remember and to this day, it provides me with so much joy and comfort. Ana didn’t take the opportunities offered in Australia for granted. She remembers studying hard at school and in university. “I knew I was one of the lucky kids who not only survived a civil war, but was given the opportunity to live in a peaceful country where a good education was readily available to anyone willing to learn,” she said. In 2005, Ana left university with Bachelor of Commerce and Bachelor of Law degrees. She also left university with her future husband in mind. “I met Tony during my third year of study and have loved him ever since,” she said. “After graduating, I was fortunate enough to be offered a graduate position in the tax law division of a big four accounting firm. “I studied for another two years to become a chartered accountant while Tony continued at uni to complete a doctorate. Ana said she had always wanted to be a mother, and her husband was keen to be a father, but there were complications. “We tried for about two years, without any luck,” she said. During a trip to Europe, where husband Tony presented a paper at a conference in Paris, Ana entered further into her faithful life adventure. “We were lucky enough to see Pope Benedict celebrate Christmas Mass at the Vatican and we also visited Fatima in Portugal where we offered many prayers for a baby,” she said. Shortly after returning from holidays, Ana and Tony discovered they were expecting a baby. They were overjoyed, but sadly that joy was short lived because Ana miscarried at eight weeks. “It was a really sad time for me,” Ana said. “I just couldn’t reconcile what was happening with what I had prayed for and, it sounds crazy and almost sacrilege to think it, but I really thought that God had got it wrong. “It took some time before I could reflect on what had happened and to see that, actually, my prayers had been heard because, although I miscarried, we had been able to conceive a baby. A little over a year later, while the couple were both working in Sydney, Ana gave birth to son Alexander. She said the shift from corporate world to full-time mum wasn’t an easy decision. “I had spent around seven years of study to be where I thought I wanted to be and the next logical step was to work my way up the corporate ladder,” Ana said. “But after much deliberation, I realised that wasn’t where I wanted to be. “At least not at that time. What I wanted was to be home with my son and that’s what I chose to prioritise. “ It continues to be one of the best decisions I have ever made. The growing Hatherley family moved to London for three years, and had a second son, Franco. Then, while moving back to Brisbane, Ana discovered she was pregnant again, and expecting another little boy. Baby Carlo was born in 2017. “Our hands had never been so full but neither had our hearts,” she said. “As the children grew older, I began to feel ready to give my career some focus. “I thought hard about what I wanted to do with the skills I had been given and while I wanted to get back into corporate life, I wanted to assist real people in a more personal way. Ana said the fact that she was a lot older than most trainee lawyers made her worry about whether she would find employment, and she found herself silencing doubt in her mind that it was too late to begin a legal study. “Through much prayer and late-night study, I was able to complete the coursework component of the legal training,” she said. “I was also fortunate enough to be offered a graduate law clerk position with a Christian law firm (Corney & Lind Lawyers) which was so much more than I had ever hoped for. Being back in the workforce as a mother of three children, Ana said she had a fresh new perspective on where she wants to be working and how she wanted to conduct herself as a lawyer. She said she was grateful to work for a firm where her beliefs were valued and she had a sense of mission. “If my experiences have taught me anything, it’s that life’s not scripted,” she said. “Careers and motherhood and success come in all different shapes and forms. “You need to prioritise what really matters to you and work towards that. If there are hopes and ideas that you need to let go of during one stage of your life, there are no rules to say you can’t pick them up again later on. Through her experiences, Ana said faith was something that must be lived, not just believed. “This isn’t something I’ve always recognised. I’ve made some pretty poor decisions during times where I’ve believed in our faith but haven’t turned those beliefs into actions,” she said. “Some of these decisions have really brought me to my knees and lower than I ever thought I could go. “And it’s been at these moments, perhaps when I’ve least deserved it, that God has picked me up and kept me moving forward. “Placing God at the centre of every decision you make in life alleviates so much fear and doubt and allows you to really live your life in accordance with His will. “When God becomes a living presence in your life, he becomes seen by everyone around you and his love touches them through you.